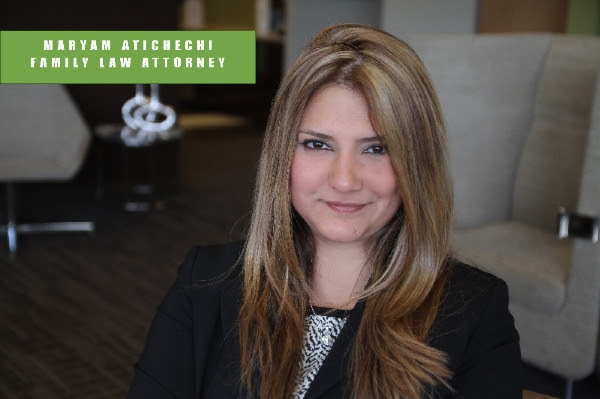 Maryam Atighechi was elected as a Super Lawyer Rising Star, an honor reserved for the top 2% of all attorneys in California who exhibit excellence in their field and was featured in Los Angeles Magazine, Super Lawyers Edition in 2014, 2015, 2016 and 2017. She was recently honored with the award of Top 10 under 40 with the National Academy of Family Lawyers Association (NAFLA) for 2016 and recently rated as Top 50 Up and Coming Women Lawyers in Southern California and Top 100 Up and Coming Rising Stars for 2017 in Southern California by Super Lawyers. Maryam’s legal career focuses exclusively on family law. She began her career in civil litigation representing a number of plaintiffs whose civil rights were undermined by major corporations and insurance companies in both state and federal court. Throughout her career, Maryam has obtained high figures in combined settlements and jury verdicts in civil matters. Maryam is unique in that she has jury trial experience which gives her an edge in the courtroom. While handling civil matters, she took on a family law case and quickly learned that her passion is in handling child custody cases and helping clients through their difficult personal lives. In Family Law, Maryam is focused on one goal: to obtain the best possible result for her client. Whether aggressive litigation is necessary or a more collaborative approach is required, a strategy is immediately devised to obtain results. Maryam works with the client, provides a listening ear through the most difficult time in his/her life, and remains compassionate without compromising aggressive representation. Maryam knows that her clients are faced with the most valued treasure, their children, and will guide them through the legal proceedings to ensure their legal rights are met. Maryam obtained a Bachelor of Science degree in Molecular and Cell Biology from the University of Connecticut. She attended Western State University School of Law where she earned a Juris Doctorate degree. While at Western, Maryam was one of a select few to be chosen to represent the school in national moot court competitions based on her superior writing and oral skills. She was honored with the opportunity to travel the nation and represent the school in mock trials. Maryam is admitted to practice law in California State Court, the United States District Court for the Central District, the United States District Court for the Southern District, is a member of the American Bar Association, the Los Angeles Bar Association and Consumer Attorneys of Los Angeles. Maryam Atighechi is an avid indoor cyclist and enjoys Soul Cycle six times a week. The Atighechi Law Group sincerely hopes you allow us the opportunity to guide you through these difficult times.